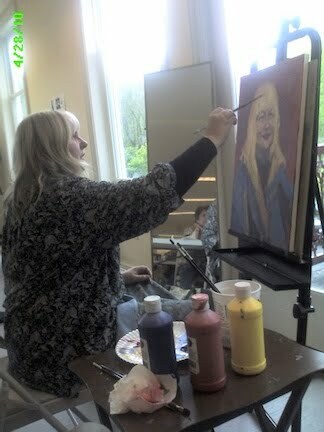 The class asked for a self portrait painting demonstration on Wednesday. Here's a photo Michael took of the process (thank you, Michael!). When we talked about why people generally look so stern in their self portraits — they're concentrating — I said I would do this of me smiling. 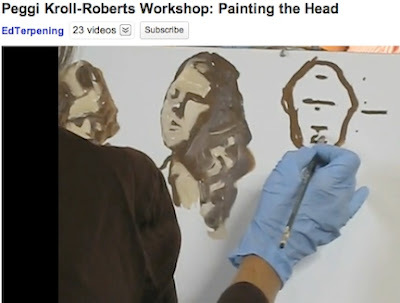 It's tough to concentrate, smile, and talk about the painting process — all while painting! In addition to the challenges presented by the process of painting portraits, we talked about the question of whether people wanted to memorialize their aging processes. As my friend and acupuncturist Rebecca Weinfeld says, we all have the vanity gene. But painting is not photography. Painting does not require the documentation of every detail of every last wrinkle, unless you really want to paint in a documentary, photorealist method. It's your painting, you make the rules. Look at shapes and values and colors – don't get sidetracked by the details. As always, use what you see as a springboard to greater creativity. 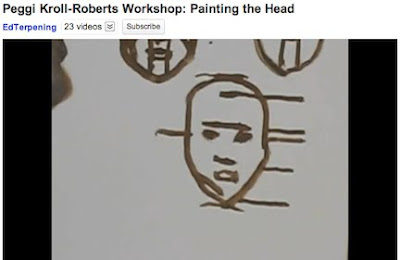 In a good, clearly explained short video, Peggi Kroll-Roberts Workshop: Painting the Head, painter Peggi Kroll-Roberts explains how to find the proportions and features of the head, with the face looking forward. She talks about seeing the head as an egg or a cube, in terms of its general shapes. Next you find the spot halfway, lengthwise, between the top of the head and the chin — that gives you the location of the eyes. The eyes are generally one eye-width apart. She next locates the hairline, and divides the lengthwise space between it and the chin in thirds. Those thirds give you the placement of the eyebrows and the bottom of the nose. Finally, she draws a small horizontal line halfway between the bottom of the nose and the chin. That serves not as the placement of the mouth, but rather the place on which the mouth rests. Having located the features, Kroll-Roberts then dilineates the planes of the face and head — first the large essential shapes on the right (above), and then the smaller planes into which the head can be further divided. Knowing these shapes will help painters not only paint them, but also understand how the light and shadow will fall on the face's features. 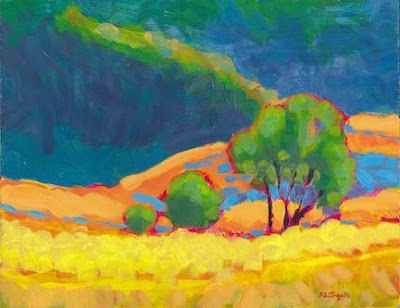 You can see more of Peggi Kroll-Roberts's artwork at www.krollroberts.com. 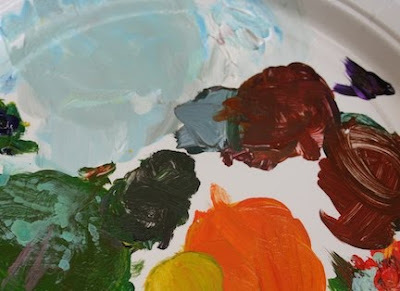 The grays and browns that you mix with your palette will ALWAYS be more interesting, and will work better in your painting, than grays and browns you get from the tube. That includes grays that you mix with white and black – a neutral gray that has its uses, but in a painting looks pretty sterile. Why do the mixed neutral colors work better? They're a little more sophisticated, a little juicier, a little richer and more colorful. They can lean in different directions – you can have cool blue grays, green grays, purpley grays, or beiges, taupes, parchment colors – all created by starting with the same three colors. 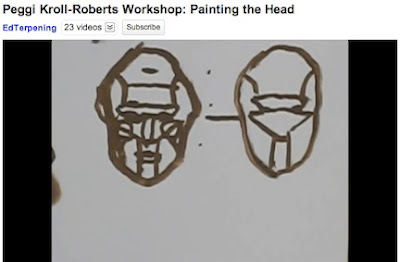 They give you lots of directions to lean in, which creates a wonderful and subtle variety of ways you can vary the colors in your painting. And, to continue my family metaphor – they all have the same DNA – the same three colors that mixed to make them. That creates color harmony. 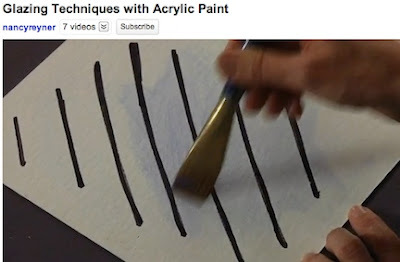 There's a reason for this.... As you paint, using the same brushes and water, you'll get a little of each color into each other color, until — presto! They're all related. They share the same characteristics - they have the same DNA (to use a familial metaphor). And you get color harmony. Knights Valley Trees and Vineyards (untitled as of yet), about 8"x10"
The simplest way to create color harmony is to begin with a limited palette. How limited? All you need is one yellow, one red, one blue, and white. With those colors, you'll be able to mix oranges, purples, greens, and most everything in between. How those mixes differ depend on which yellow, which red, which blue, and which white you choose. Your three colors, with white, become like a family. Whatever you mix with them comes from them – as I'm fond of saying, all those mixes have the same DNA. They are related. Hence – color harmony. 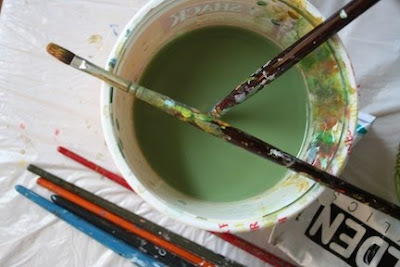 Now, say you're painting the image of a tree, and instead of mixing your yellow and blue, you pull out a separate tube of green for its leaves. You'll find it doesn't fit in with its surroundings. It's not related. It doesn't have the same DNA as the colors around it. Note: In the little painting above, I used primary magenta, primary cyan, a light yellow ( a mixing, or printer's, palette), and Titanium white. 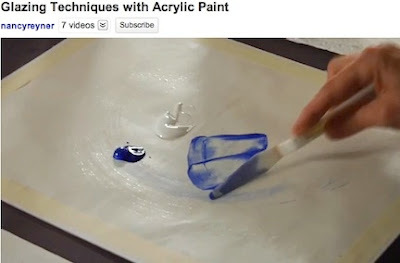 Nancy Reyner, the author of Acrylic Revolution, gives a good demonstration of how to mix and apply an acrylic glaze in the online video Glazing Techniques with Acrylic Paint. Here, she demonstrates mixing the glaze. It's important not to mix the glazing medium into the paint, because you won't get the right thinness of glaze. She makes a mixture of medium, and then paint, separate from the original spots of medium and glaze, so as not to contaminate them. 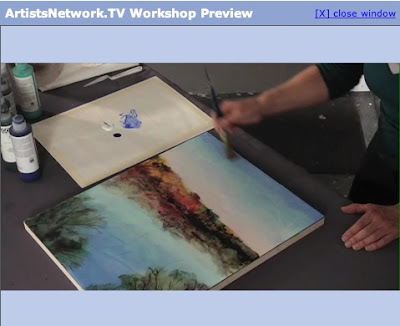 Then she demonstrates the thinness of the glaze, and how to apply it using a soft brush. This is something you definitely don't want to use a bristle brush for! The softer brush hairs will allow a softer application of the glaze – one that doesn't show brush marks. Finally, she applies the glaze to her painting. It's important not to keep working over a glaze once it begins to dry and get tacky – that would ruin the work you've already done. To speed up the process, she uses a hair dryer (a heat gun would work, too) to dry the glaze, so that she can continue applying another layer of glaze. 1. She likes to apply a little glaze in a small area with a brush, and then spread the color thinly and evenly with a rag. 2. Applying a thin layer of Golden's Acrylic Glazing Liquid, which is more fluid than the regular glazing medium, before glazing helps smooth the glazing process. While the Acrylic Glazing Liquid is still wet, she then works colored glazes into it. 3. She also suggests using Golden's Open Acrylics for mixing glazes, as they allow more time for drying. It makes applying the glazes much easier – but remember to allow each layer of glaze to fully dry before you come back with another layer over the top. 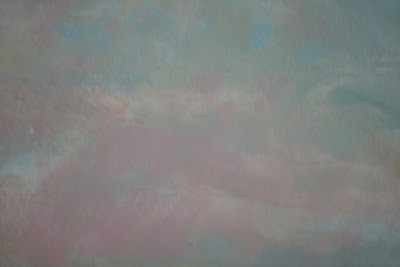 You can see Nancy Reyner's website at www.nancyreyner.com, and her painting blog at http://nancyreyner.blogspot.com.